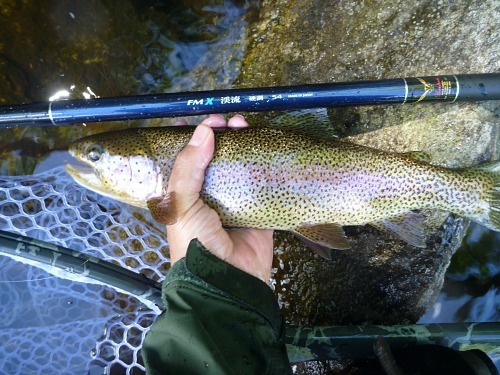 The Suntech FMX Keiryu stiff is one of three rods released last year by Suntech, a small Japanese company known for excellent quality Ayu and Keiryu rods. The other two are the FMX Keiryu ZPRO, which is a very soft, full flex rod, and the FMX Keiryu extra stiff, which truly is extra stiff and is the stiffest keiryu rod I have ever measured. The rods come in four lengths: 45, 54, 62 and 72. I have the 45, 54 and 62 in stock. They are beefy rods that are capable of landing very nice fish. The FMX Keiryu stiff 45 is a 32 penny rod, a penny more than the TUSA Amago and a penny less than the Daiwa Enshou LT44SF (which is the nicest big fish tenkara rod I know of). Based on the penny rating, the Suntech FMX Keiryu stiff should be more capable than the Daiwa Kiyose 43M. It is a bit longer than many other 4.5m rods at just an inch shy of 15 feet. Some anglers are going to be quite comfortable fishing it one handed, and it is easier to fish one handed than the Nissin 2-Way 450ZX stiff, but some will prefer to use both. I can tell you that if you hook a big enough fish, you will want to use both hands anyway! The FMX Keiryu stiff 54, shown above with a nice rainbow and to the right with a nice channel cat, is a 40 penny rod, which is substantially more than the Nissin 540ZX medium (30 pennies) and the Suntech Field Master 53 (33 pennies). The rod is lighter and not quite as stiff as the Nissin 540ZX stiff (44 pennies), making it more pleasant to to fish with (whether tenkara or keiryu). It would be a nice upgrade from the Nissin 540ZX medium. It is higher quality rod and more capable as well. The Nissin 540ZX medium is rated for a maximum of 6X tippet, while the FMX Keiryu stiff is rated for 5X. What can you catch with it? Anything you can catch with 5X tippet. I expect to see catches in the mid twenty inch range with this rod. For tenkara fishing, it is just stiff enough that I would suggest a size 3.5 level line. It would certainly be adequate for fishing weighted nymphs and streamers - even a large Muddler Minnow (which I did extremely well with last year in Maine). The FMX Keiryu stiff 62 is smoother casting and more capable than the 54. I don't know what the upper limit on catches will be, but I am pretty sure the rod will handle any trout or bass the average angler will ever hook. It is a bit heavier than the Keiryu Sawanobori 63, but the Keiryu Sawanobori 63 is a bit more expensive.The FMX Keiryu stiff is lighter than the Field Master 62 (which I always fished at full extension anyway) and it is much lighter than the Nissin 2-Way 620ZX stiff. The Suntech FMX Keiryu stiff rods are likely to be quite popular rods. They have the Suntech quality people have come to expect and are a bit less expensive than Suntech's Keiryu Sawanobori or Kaname rods. As much as I have written recently about the Zero Fishing concept (which is ultra, ultra light with respect to rods, lines, hooks, split shot, etc.) most Americans see keiryu rods as rods for bigger water and bigger fish. Most of the rivers in the US large enough to use a 5.4m rod are home to large fish. 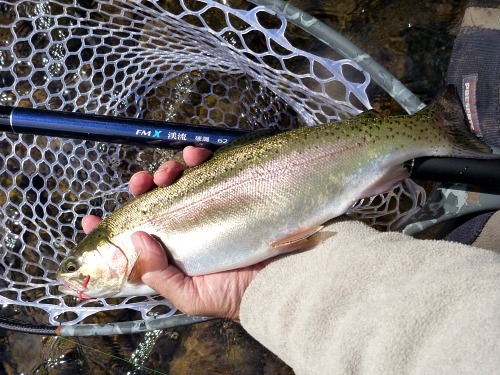 Not every fish, to be sure, but many that would be a once in a lifetime catch for the average Japanese tenkara angler. If you are fishing the Madison, or the White, or the Delaware, or the Snake, or any larger river that has a healthy trout population, you could hook a fish that would be a once in a lifetime catch for yourself as well. No reason not to fish with a rod that could handle it. Oh, and all those guys who have asked me over the years for a bass rod. This rod will cast big flies and handle big bass. Also, more people are starting to fish for catfish with keiryu rods, and the Suntech FMX Keiryu stiff rods should do fine. First off, I should probably state that what I call "stiff" is what the Japanese call kocho (硬調), which is variously translated as "high contrast", "hard" or "hard condition." In reality, it is pretty much the standard stiffness for keiryu rods. There are softer rods and stiffer rods, but kocho is the standard. 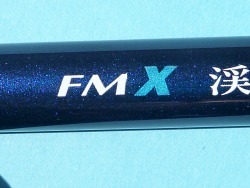 Like all keiryu rod grips I have ever seen, the FMX Keiryu stiff grip is just a widened out section of the blank, covered with a nonskid finish. In this case the finish is smooth to the touch but is a very effective nonskid finish, whether dry or wet. The grip section above the nonskid has a deep blue finish with bright speckles. I'd have to say that Suntech does a nice job with their rod finishes. They look very nice but aren't over the top. 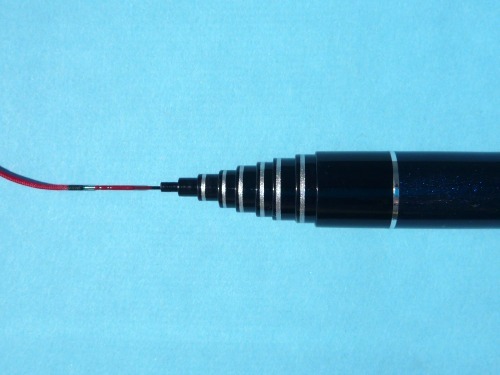 The tip end of the grip section has a black band, separated from the blue by a silver ring. The silver ring is repeated on all but the smallest couple sections. Suntech's signature swivel, which they call a "Lillian Spin" attaches the lillian and easily passes through the second section. 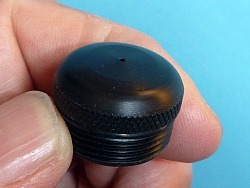 The grip screw cap is knurled for easy tightening or removal, beveled for comfort in case you want to grip the very end of the rod, and has a ventilation hole. The ventilation hole is primarily to make it easier to collapse the rod (so you are not pushing against compressed air) rather than to let the inside of the rod dry out. I highly recommend taking the rod apart between uses to allow it to dry thoroughly. If you live outside the US, you must add shipping (below).